The sheer diversity of Chinese cuisine never fails to amaze me. Each region, each country, each city literally has their own dishes, usually dictated by the geographical conditions and produce. This round, its Putian which is the beautiful costal of the Fujian province in China. The people of Putian are also known as XingHua, Heng Hwa or Hing Wa. Malaysia has a small community of Heng Hwa in several cities so Heng Hwa cuisine is available usually in smaller towns. The Heng Hwa cuisine is pretty unique. Based on the geographical location, Heng Hwa cuisine is blessed with many dishes from land and sea. The cuisine is humble and yet refine and comforting. It’s unpretentious and lets the ingredients speak for themselves in its purest form of cooking. A lot of their dishes are fresh and delicate in flavours, yet there are punches of robust notes in some ways. 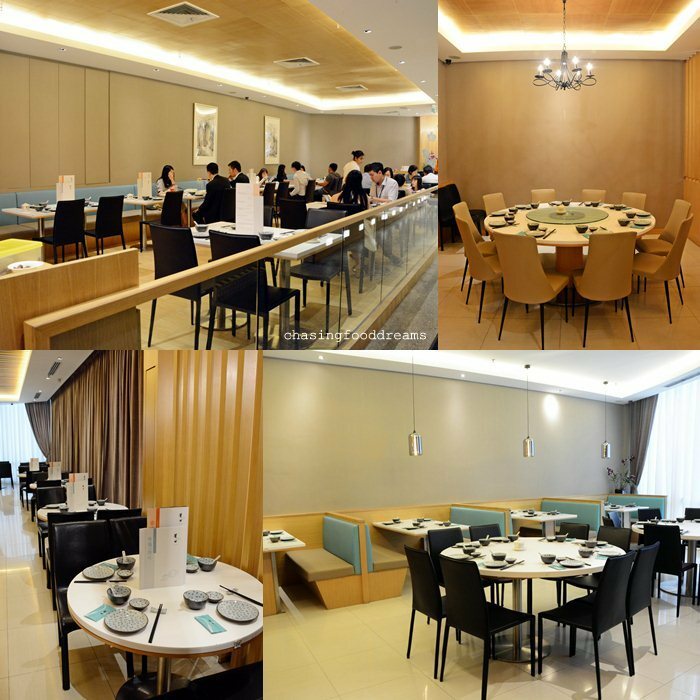 So it’s my first time trying Heng Hwa cuisine at Putien Restaurant located at One Utama recently with my regular entourage of foodies a few weeks ago. Putien is celebrating their summer’s harvest fresh produce from the region. As mentioned, the cuisine relies mostly on their fresh harvest from land and sea and the natural flavours of the ingredients take centerstage. Putien goes all out and imports a good list of their ingredients from the region to ensure authenticity of their dishes. Putien’s chef is also from Putian and the restaurant now has two outlets with the first one in One Utama and the second in Sunway Mall. That evening, we dine on the regular menu together with some of the Summer Harvest new dishes available at Putien from June onwards. I like the environment at Putien in One Utama. Decorated in a neutral light wood theme with some black for contrast, it is soothing at sight. The dining area is spacious and nicely sectioned off for privacy. There are also some private rooms as well. It’s modern and contemporary with bright lighting, sending warmness all over the ambience. For drinks, I had their Nature’s Goodness (RM8.50) while my other half had their Homemade Sweet Corn Juice (RM8.50) served warm. I love my juice that was vibrant and refreshing. The healthy concoction of pineapple, green vegetables with plums is perfectly thirst-quenching and good for me too. The sweet corn is lovely too with its sweet and creamy corn notes. Small bites are served while we waited for our food. The pot of Putien signature chili sauce is literally a pot of gold. The sauce is delicious and super spicy. I had copious amount of the chili sauce as it really is addictive. The chili sauce is available for sale at RM12.90. Dinner started on a lavish note of exquisite Iced Abalone (RM37.00). The luxurious molluscs is affordable and is treated with great respect. Lightly poached, the abalone is chilled and served on ice. It is tender and delicate in natural flavours. Putian is famous for its premium seafood harvest and abalone is a good choice to order as one can enjoy the fresh and sweet delicacy in its natural flavours. Iced Bitter Gourd (RM8.50) is presented like a bloom on ice. Translucent thin, the bitter gourd is lightly crunchy and is savored with a side of honey. It’s wonderfully refreshing! More seafood appetizers with Drunken Cockles (RM15.50), another Putien signature of showcasing seafood in a minimalist way. Painstakingly half shelled and lightly blanched, the cockles are covered in pungent fresh minced garlic and chili with a wine marinade. This one packed a punch unforgettable flavours. Looking deceptively plain, the Seaweed with Mini Shrimps (RM15.50) flavours tasted otherwise. There is a sense of earthy and lightly briny note in the lightly sweet and tangy seaweed. I enjoyed this dish a lot with its seaweed texture and the miniscule shrimps. The Stir Fried Yam (RM20.50) is one of my favorite dish that night. Cube yam is cleverly steamed and fried with a crispy layer and a creamy powdery inside. If I am not mistaken, I think this is coated with a layer of caramelized sugar based savory sweet sauce to achieve its crunchy outer layer. Love the simplicity of the yam as the balance of savory and sweet is just right while the texture is unique and very enjoyable. Putien Style Oyster Omelette (RM22.50) is another crowd favorite that evening. Baby oysters from Putian is delectably sweet with perky briny notes. The baby oysters are skillfully enrobed in fluffy egg with lots of chopped scallions and chives. One gets a burst of juicy unctuous oyster flavours with subtle hints of oniony notes. Savor the omelette with that awesome chili sauce for extra pleasures! Though I thought that the Shredded Meat with Bun (RM6.50 per piece with minimum order of 2 pcs) was a tad oily from the buns, I didn’t mind it one bit. Sink your teeth into crisp and fluffy sesame mantao sandwiched with sautéed shredded pork tenderloin with lots of sweet onions. It’s aromatic and easy to enjoy as it is tasty. Stir Fried Lotus Root with Prawn (RM38.90) is also another Summer Harvest dish. This one is relatively simple but nevertheless delicious with crunchy lotus root and sweet bouncy prawns. I spied quite a few tables enjoying the Deep Fried Pig’s Trotter with Salt & Pepper (RM13.00 per piece with minimum order of 2 pcs) that evening. Using precise 7 inch pig’s trotter imported from Australia, it is a 12-hour cooking journey feat for a few minutes of enjoyment. Gloves are provided to allow diners to just enjoy them the way it should be enjoy. The finalized trotter is worth every bite. Crispy skin, moist gelatinous collagen, unctuous flavours and addictive, it’s a dish you won’t want to miss at Putien! Besides enjoying the earlier dishes with rice, Heng Hwa cuisine also takes their noodles seriously. Heng Hwa noodles are unlike our noodles. There are quite a few types of Heng Hwa noodles and these are also imported from Putian region. It is almost impossible to get the noodles here as they are made to specific process perfected in that region’s geographical elements. Don’t be fool by the plain looking bowl of Putien Lor Mee (RM21.50). It is a bowl of warm and comforting flavours. Silky medium thick wheat noodles are cooked in pork broth with prawns, pork belly, Chinese cabbage, clams and many more goodies. The moreish flavours of the noodles had me sighing at pleasure with every slurp. The dish is a sure winner with every one of all ages. Fried Heng Hwa Bee Hoon (RM21.50) is another specialty of Putien and this one uses thin rice noodles or Bee Hoon. The rice noodles is somewhat different from ours as there is a silky and chewy bite to them which I really enjoy. This Heng Hwa Bee Hoon is milled by hand and is sundried at the crack of dawn to achieve its texture. It is sautéed with prawns, clams, peanuts and other ingredients with milky pork bone stock. It’s a best seller at Putien and the reasons are quite obvious, fresh ingredients and lots of love goes into making this dish! Spinach with Salted Egg & Century Egg in Supreme Stock (RM20.50) was more familiar as the dish is much savored by many in other restaurants as well. Tender spinach leaves braised in supreme stock with the much Chinese-beloved salted egg and century egg yielded soothing flavours that many would enjoy. After that long list of dishes, I didn’t feel heavy at all. It’s probably due to the fact that the dishes at Putien focused on showcasing fresh ingredients prepared in minimal cooking time and flavours. The dishes are also pretty healthy and balanced, leaving us with room for some sweets. Putien’s desserts is beautifully listed in its own menu. There is a good list of sweets and being the explorers we are, we had one of each to share. Sweet Potato Balls (RM8.00 for 6 pieces) seemed to share the same fame with our local ones as well as Taiwan sweet potato balls. Crispy with creamy and sweet potato mashed, the balls are delightful as snacks or desserts. Pumpkin Cream with Ice Cream (RM11.50) sounded a bit odd but the combination worked well in terms of flavours. The pumpkin cream is not overly sweet and the creamy cold coconut ice cream enhanced the pumpkin nicely. Blueberry sauce and crushed peanuts added a different twist to this dessert. Unique and delicious! If you enjoy hot dessert, then Hot Yam Paste with Gingko Nuts (RM6.50) may be a good choice. Similar to the Teochew dessert, yam is steamed, mashed and cooked, the yam paste is creamy and silky smooth with a powdery note. If you prefer more refreshing flavours, then opt for the Chilled Lemongrass Jelly with Fruits (RM6.50) or Chilled Putian Loquat in Herbal Jelly (RM9.00). Both jellies are lighter on the palate and easy to enjoy. One uses lemongrass while the other opted for Chinese herbs for medicinal benefits. Another unique dessert to try is the Purple Sweet Potato with Pumpkin Cream (RM9.00). Who would have thought pairing sweet potato with pumpkin in cold dessert would be a hit? This dessert is lusciously creamy and nicely sweet. Putien showed finesse in serving up refine Heng Hwa cuisine. One can certainly taste the quality of the ingredients. Besides, there is nothing much to hide when ingredients are prepared simple and uncomplicated to show off the natural notes of the produce. Highlights for me are the Iced Abalone, Seaweed with Mini Shrimps, Braised Pig Intestines, Putien Style Oyster Omelette, Braised Bean Curd with Cabbage, Putien Lor Mee and Fried Heng Hwa Bee Hoon. Awesome post. I was checking ceaselessly this blog and I am awed! To a great degree helpful data particularly the last part, I tend to such information a considerable measure.